Four students from West Hernando Middle School are facing charges after police say they broke into a home on Wednesday and stole numerous things, including two guns. 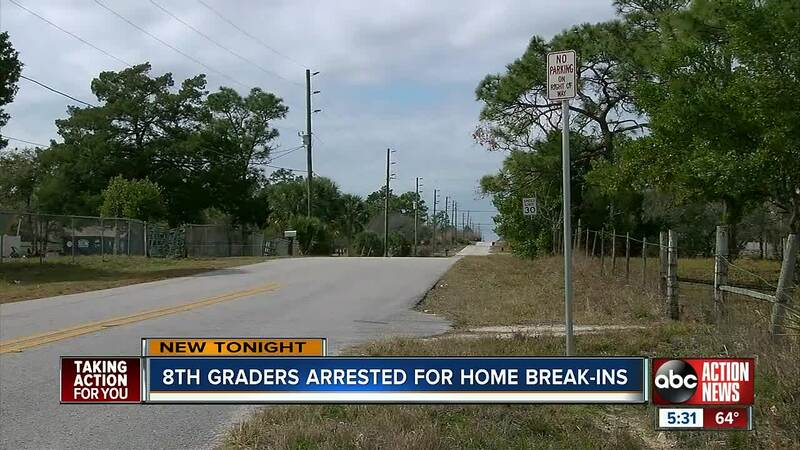 BROOKSVILLE, Fla. — Four students from West Hernando Middle School are facing charges after police say they broke into a home on Wednesday and stole numerous things, including two guns. Authorities were called to the home on Sun Road around 7p.m. on Wednesday. The homeowner told them two guns were stolen and one had been fired into the mattress in his master bedroom. A witness told detectives they saw four boys walking up and down the road that afternoon, with at least one carrying a gun case. That witness was able to identify two of the boys. Those boys were interviewed, with their parents present, and gave authorities the names of the other boys. All of the boys confessed to the burglary when they were interviewed, authorities say. The boys told detectives one of them accidentally fired the round that was found inside the mattress. The boy, who shot the gun, told them he almost shot himself in the leg. Detectives learned the group also burglarized another home on the same road. One of the boys led them to it and provided information. The boys, all 14 or 15 years old, each face two counts of grand theft firearm and one count burglary of a dwelling. The guns and most of the other stolen items were recovered, detectives say.